Please login or register to hide this ad -- it's free and easy! As of January 1, 2019, we have closed our forums. This is a decision we did not come to lightly, but it is necessary. The software our forums run on is just too out-of-date and it poses a significant security risk. The server software itself must be updated, and it cannot be without removing the forums. So it is with a heavy heart that we say goodbye to our long-running forums. They came online in 2000 and brought together so many wonderful Disney fans. We had friendships form, careers launch, couples marry, children born ... all because of this amazing community. Thank you to each of you who were a part of this community. You made it possible. And a very special thank you to our Guides (moderators), past and present, who kept our forums a happy place to be. You are the glue that held everything together, and we are forever grateful to you. Thank you aliceinwdw, Caldercup, MrsM, WillCAD, Fortissimo, GingerJ, HiddenMickey, CRCrazy, Eeyoresmom, disneyknut, disneydani, Cam22, chezp, WDWfan, Luvsun, KMB733, rescuesk, OhToodles!, Colexis Mom, lfredsbo, HiddenMickey, DrDolphin, DopeyGirl, duck addict, Disneybine, PixieMichele, Sandra Bostwick, Eeyore Tattoo, DyanKJ130, Suzy Q'Disney, LilMarcieMouse, AllisonG, Belle*, Chrissi, Brant, DawnDenise, Crystalloubear, Disneymom9092, FanOfMickey, Goofy4Goofy, GoofyMom, Home4us123, iamgrumpy, ilovedisney247, Jennifer2003, Jenny Pooh, KrisLuvsDisney, Ladyt, Laughaholic88, LauraBelle Hime, Lilianna, LizardCop, Loobyoxlip, lukeandbrooksmom, marisag, michnash, MickeyMAC, OffKilter_Lynn, PamelaK, Poor_Eeyore, ripkensnana, RobDVC, SHEANA1226, Shell of the South, snoozin, Statelady01, Tara O'Hara, tigger22, Tink and Co., Tinkerbelz, WDWJAMBA, wdwlovers, Wendyismyname, whoSEZ, WildforWD, and WvuGrrrl. You made the magic. We want to personally thank Sara Varney, who coordinated our community for many years (among so many other things she did for us), and Cheryl Pendry, our Message Board Manager who helped train our Guides, and Ginger Jabour, who helped us with the PassPorter-specific forums and Live! Guides. Thank you for your time, energy, and enthusiasm​. You made it all happen. There are other changes as well. Moving on with the current of the years. Ever on with each rising sun. To a new day, we go on. It's time to move on and move forward. PassPorter is a small business, and for many years it supported our family. But the world changed, print books took a backseat to the Internet, and for a long time now it has been unable to make ends meet. We've had to find new ways to support our family, which means new careers and less and less time available to devote to our first baby, PassPorter. But eventually, we must move on and move forward. It is the right thing to do. So we are retiring this newsletter, as we simply cannot keep up with it. Many thanks to Mouse Fan Travel who supported it all these years, to All Ears and MousePlanet who helped us with news, to our many article contributors, and -- most importantly -- to Sara Varney who edited our newsletter so wonderfully for years and years. And we are no longer charging for the Live Guides. If you have a subscription, it's yours to keep for the lifetime of the Live Guides at no additional cost. The Live Guides will stay online, barring server issues and technical problems, for all of 2019. That said, PassPorter is not going away. Most of the resources will remain online for as long as we can support them, and after that we will find ways to make whatever we can available. PassPorter means a great deal to us, and to many of you, and we will do our best to keep it alive in whatever way we can. Our server costs are high, and they'll need to come out of our pockets, so in the future you can expect some changes so we can bring those costs down. Thank you, thank you, thank you for your amazing support over the years. Without you, there's no way us little guys could have made something like this happen and given the "big guys" a run for their money. PassPorter was consistently the #3 guidebook after the Unofficial and Official guides, which was really unheard of for such a small company to do. We ROCKED it thanks to you and your support and love! If you miss us, you can still find some of us online. Sara started a new blog at DisneyParkPrincess.com -- I strongly urge you to visit and get on her mailing list. She IS the Disney park princess and knows Disney backward and forward. And I am blogging as well at JenniferMaker.com, which is a little craft blog I started a couple of years ago to make ends meet. You can see and hear me in my craft show at https://www.youtube.com/c/jennifermaker . 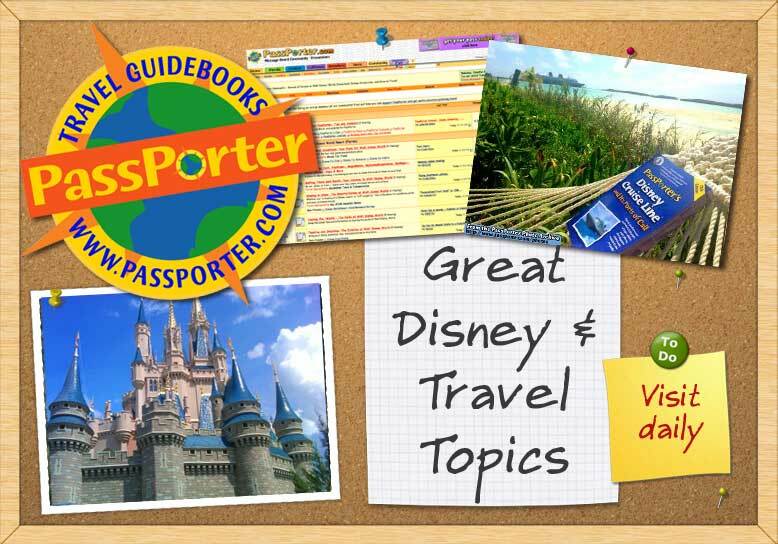 Many PassPorter readers and fans are on Facebook, in groups they formed like the PassPorter Trip Reports and PassPorter Crafting Challenge (if you join, just let them know you read about it in the newsletter). And some of our most devoted community members started a forum of their own at Pixie Dust Lane and all are invited over. So we encourage you to stay in touch with us and your fellow community members wherever works best for you! Best wishes for a wonderful and magical new year! Welcome! We're happy you've found the PassPorter Community -- the friendliest place to plan your vacation to Walt Disney World, Disney Cruise Line, Disneyland, and the world in general! You are now viewing the PassPorter Message Board Community as a guest, which gives you limited access. As our guest, feel free to browse our messages by selecting the forum you want to visit from the list below. To post messages and ask questions, join our FREE community today and you'll get access to tools and resources not available to guests, such as our vacation countown timers, "living" avatars, private messaging system, database searches, downloads, and a special PassPorter discount code. Registration is fast, simple, and completely free. Just click the Join Our Community link. If you think you've already joined, log in below now. If you don't remember your member name or password, please visit our Member Name and Password Recovery page. You are also welcome to contact us. Please login or register to hide these ads -- it's free and easy! Feedback Buttons provided by Advanced Post Thanks / Like v3.4.0 Patch Level 1 (Pro) - vBulletin Mods & Addons Copyright © 2019 DragonByte Technologies Ltd.